THE NEW RIO IPL 8000 PERMANENT HAIR REMOVAL SYSTEM. TREATS UPTO 180 HAIRS IN A FEW SECONDS. SENT WITH EXPRESS TRACK & TRACE. Pulsed-light hair removal system for body care in the comfort of your own home. A complete video guide that ensures you get the best out your IPL unit from the very first time you use it. Treats up to 180 hairs every few seconds - for quicker, more effective hair removal. Provides up to 40,000 flashes more than enough to remove every single hair on your body! And, unlike some of our competitors units, its replaceable. Puts you in control of exactly the right power level, for each different area of your body. Your machine wont overheat, giving you treatment sessions that are as long as you want them to be. Only you can turn on your machine, so inquisitive little fingers stay safe! Promotes a blink reflex so your eyes can never be exposed to high levels of light. No risk of UV rays damaging your skin. Some units need recharging, but not ours, so you can enjoy treatment sessions at your own pace. To ensure an efficient treatment flash, every time. Shows where youve treated, so where to go. For quicker, more efficient long-term hair removal legs, arms, bikini line, back, chest and face. Energy Saving Mode Enters this mode if unused for 20 minutes thoughtful in design and action! Everyones hair grows differently, depending on age, weight, metabolism, hormones, ethnicity, medications and other factors. However, all hair goes through three distinct phases. Or active growth phase when hair grows actively. Or degradation phase - when hair stops growing but is not yet shed. Or resting phase - when hair falls out and a new hair begins to form. IPL treatment is effective when the hair is in the active growth phase. And because at any one time there is only a percentage of hairs in this phase (the actual percentage varies from one body area to another) some follicles will be destroyed, others may be reduced to producing only vellus hairs (light fine hairs) and some will be disabled - helping prevent hair regrowth. To achieve this, the Intense Pulsed Light Hair Remover sends pulses of intense light directly to the hair follicle, with enough energy to either destroy or disable the root but without affecting the surrounding area. And as IPL covers a much larger area than the relatively small treatment spots that lasers manage, you see and feel the results much more quickly. Which, of course, is just what you want all-over soft, silky smooth skin. The pulsed light energy emitted by the device destroys hair follicles for permanent hair removal. The Rio IPL-8000 also has a reinforced security system. 8 levels of security for your peace of mind. A 30,000 flash bulb for pulsed light epilation of the entire body (6 sessions including underarms + bikini + full leg). Security system with key and access code. UV filter on the treatment area. Not suitable for tanned or dark skin tones, for example, those of Afro-Caribbean, black African, Indian or Pakistani decent. Even if your skin tone appears to be suitable on the skin tone chart, do not use if close relations (parents/grandparents) have skin tones as described above. Not suitable for red, light blonde, grey or white hair. Not for use on or by children under 14 years old. Not for use on or by children between 14 and 17 years old without parental supervision. The Intense Pulsed Light Hair Remover is suitable for fair coloured skin through to olive skin types. For effective treatment the hair needs to be darker than the surrounding skin; the best results are usually achieved on pale skin with dark hair. Also, we usually find that different power levels are required on different body areas, so you should test each area to establish the appropriate maximum power level for you its easy to do as our step-by-step DVD shows you exactly how. How should I prepare my skin for Intense Pulsed Light hair removal? Ensure your skin is clean. IPL hair removal is most effective on pale skin. Sunbathing, use of sun beds and fake tanning should NOT be undertaken prior to treatment. How should I prepare the hairs for Intense Pulsed Light hair removal? Shave the area to be treated. Minimising the length of the hair enables the light energy to go directly to the hair root and avoids hair burning on the surface of the skin. What areas can I treat? Most body hair can be removed using IPL - the most common areas are underarms, legs, chest, back and bikini line. Certain areas of the face can be treated, but it should not be used around the eyes or the lips. What does it feel like? Most people experience a warming of the skin. Slight irritation similar to that of a minor sunburn may be felt if used on too high a power level, or if the area has not been shaved. Men undergoing the procedure experience greater discomfort as male body hair is generally thicker than womens, however the sensation quickly disappears. Can I use the Intense Pulsed Light Hair Remover on sensitive skin? Yes, the IPL reacts with the hair, so the surrounding skin should not be affected. How will my skin appear after the treatment? Usually there will be no perceptible change. A slight redness after treatment may occur, but will normally fade over 24 hours. There may be some localised redness around the hair follicle - this is quite normal. However, if any redness or inflammation remains after 24 hours this would indicate you have selected too high a power level for your skin type. After Intense Pulsed Light hair removal is there anything to avoid? Sun exposure or deep tanning should be avoided for at least 48 hours. How often should I repeat IPL hair removal treatment? The timing for follow on treatments is not critical. We initially recommend treatments at 2 week intervals, although some people like to treat the area every week and others just once a month depending on personal preference and on where the treatment area is. As long as the hair follicle or surrounding skin is not red, sore or inflamed, treatment can be repeated after a minimum of 48 hours. Choose a time which is convenient for you. Avoid excessive treatment on the same region at one time. This may cause reddening and swelling. To maintain hair free skin and to ensure disabled hair follicles remain dormant, repeat the treatment every 4 to 6 weeks or as required. Is there any aftercare routine I should follow? If you wish, you can apply an unperfumed soothing lotion, an ice pack or wet towel to cool the treated areas, though we recommend not using soap on the treated areas for 24 hours. Take care to keep the treated area particularly clean for 3 days. When treating the underarms, avoid using antiperspirant deodorant for 23 days. Avoid unnecessary sun exposure for 48 hours. How many treatments are required? Long term hair removal with IPL is generally considered to be effective after a minimum of six treatments over a period of 6 months. This varies from person to person and depends on the area you are treating, hair density, your hairs growth cycle and colour. Dark hair on fair skin responds to IPL best, but both dark and fair hair may take several treatments for long-term results. Initially with each treatment you will notice a gradual thinning/reduction of hair growth in the treated area. Can I use other hair removal methods between treatments? Because IPL treatment needs a hair to be present in the follicle, hair removal methods which pluck the hair, such as waxing, epilators and tweezing are NOT suitable for use between treatments. Bleaching hairs is also NOT suitable as it removes the pigment and renders IPL treatment ineffective. Shaving, micro-dermabrasion discs and cream depilatories are ideal for use between treatments. What is the difference between Intense Pulsed Light Hair Remover and a laser? There are two big differences between Lasers and Intense Pulsed Light. Generally IPL covers a much larger area than the relatively small treatment spot with lasers and therefore treatments of larger areas are much quicker. The other difference is the wavelength of light produced. Lasers produce light with a specific wavelength whilst IPL uses a broad spectrum of wavelengths. This limits IPL to specific skin types. How big is the treatment area? Why is it important to shave? It is important that any area being treated is shaved so all the light energy is directed straight to the hair root for maximum effect. This also prevents burning of the hair above the skin surface which can be uncomfortable. What safety features does it have? The main safety feature regulates the power level, so that it can only be increased by 1 step per treatment, starting from power level 1. This reduces the risk of using too high a power level. Power can be decreased in as many steps as required. A security code to prevent misuse. Skin sensors on the wand to ensure IPL treatment only occurs when good contact is made with the skin. A bright orange blink safety light which will cause a blink reaction if pointed directly at the eye. A UV filter in the IPL aperture to avoid the risk of damaging UV light. Are there any side effects? As with all hair removers which use light energy, there may be slight reddening of the skin after use or lightening of the skin in patches. They should both disappear within 24 hours. A Replacement treatment cartridge with high performance quartz bulb with up to 40,000 treatment flashes. If you have registered business use that address , for faster service. 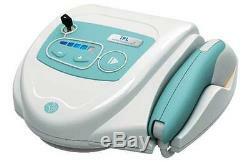 The item "NEW RIO IPL 8000 laser HAIR REMOVER 40,000 shots" is in sale since Tuesday, February 26, 2013. This item is in the category "Health & Beauty\Shaving & Hair Removal\Epilators & Electrolysis". The seller is "home-salon" and is located in bromley, Kent. This item can be shipped worldwide.